Where Do They Live? - hori-nakhtmins Webseite! The Twelfth Dynasty of ancient Egypt forms together with Dynasties XI, XIII and XIV the Middle Kingdom (from about 2000 BC to 1700 BC). It was the prime time of the Middle Kingdom. Strong rulers expanded the borders and provided for a period of stability and wealth. In those times ancient Egyptian literature was refined. Perhaps the best known work from this period is The Story of Sinuhe, of which several hundred papyrus copies have been recovered. Also written during this dynasty were a number of didactic works, such as the Instructions of Amenemhat and The Tale of the Eloquent Peasant. Pharaoh Amenemhat I founded the new capital Itj-tawy in a still unidentified location in the Fayum region. Its burial sites were found at Lisht, el-Lahun and Dahshur. Khakhaure Senusret III was the fifth pharaoh of the Twelfth Dynasty of the Middle Kingdom. He ruled from 1878 BC to 1839 BC during a time of great power and prosperity for ancient Egypt. 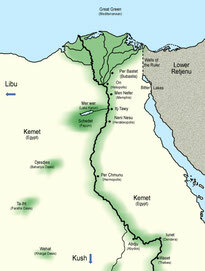 Among other achievements, he had the Canal of the Pharaohs built, an ancient antecedent to the Suez Canal. He is considered the most powerful Egyptian ruler of the dynasty. His military campaigns gave rise to an era of peace and economic prosperity that reduced the power of regional rulers and led to a revival in craftwork, trade and urban development. He was married to Khenemetneferhedjet II, called Sherit, and Neferthenut. He fathered the children Sithathor, Menet, Senetsenebtysy, Meret and the later Pharaoh Amenemhat III.